Holly Throsby's debut novel Goodwood explores life in a small Australian country town through the eyes of seventeen-year-old Jean Brown. Set in 1992, it begins the week two people go missing. The town is thrown in uproar and speculation immediately begins. About every fifth chapter or so Jean introduces the reader to another resident of Goodwood and their connection to the missing people. This is not a detective novel in the true sense because, while the mystery is solved, it isn’t the work of one person but of the town’s accumulative memory. 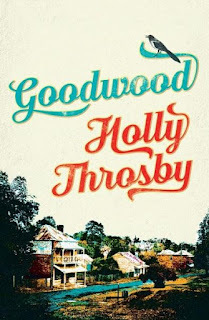 This is a great, slow read for anyone who loves Australiana, the 90s or mystery novels. It does touch on some difficult issues such as domestic violent and teen drinking, but everything is handled with respect. My only problem with this novel was the difficultly I had keeping track of many the characters. All in all, I would recommend this book. This book was sent to me by the publishers, but all views stated are my own.